At the Fifth line, our goal is to help our clients achieve their greatest fitness potential. We believe that striving toward and attaining your personal best will brings focus, joy and fulfillment to all areas of your life. Fitness goals and the ideal method for achieving those goals are unique to each client. Some prefer the flexible power of Gyrotonic and the dynamic core strength of Pilates, for others, it is the raw energy of TRX, or the profound support of Alexander Technique. We're committed to these disciplines and our highly trained instructors partner with you to develop a plan that is firmly attuned to your physical and emotional needs. Janine has spent her career devoted to fitness and dance. A true body movement pioneer, she opened the first Gyrotonic studio in Kansas City in 2002. Seven years later, she moved East and has been bringing her experience and passion to clients and instructors in Brooklyn ever since. Yoga has also defined Janine's life. She completed teacher trainings with David Swenson, Max Strom Bhavani Maki, and studied further with Tim Miller, Beryl Bender Birch, Mark Blanchard, David Williams, Bryan Kest, Ana Forrest, Kim Schwartz, Rolf Gates, among others. Determined to expand her repertoire and expertise, Janine studied the Alexander Technique at the Balance Arts Center and Pilates at The Kane School, both in New York City. She also completed training in Gyrotonic applications for golf, physical therapy, breast cancer, pre and post natal, specialized Gyrotonic equipment. In addition she has completed Level II training for Gyrotonic Expansion System. Janine is renowned for her passion, support, and technique. In particular, she believes that age is not defining. Whether young or old, everyone can tap the peaks of their physical intelligence and learn to walk, run, and move in ways they never dreamed possible. Janine has made it her life's mission to help students reach these heights. Sarah was first introduced to Alexander Technique through the study and practice of postmodern dance and performance. Her teaching is inspired by her experience as a professional dancer and performance artist and draws from a rich culture of mind-body, movement and energy practices. After trying a number of other body therapies, the Alexander Technique was the one re-education method she found that adequately addressed and effectively eliminated the chronic back pain she had experienced in her early dance training. She received her BFA in Dance from the University of Missouri, KC in 1999, and in 2007, her Alexander Technique Teaching Certificate from the Balance Arts Center in New York City. In addition to maintaining a private practice in the Alexander Technique, she has taught at various schools in New York City including Balance Arts Center, Movement Research, Class Class Class, and Parson’s School of Design. Additionally, she holds an MFA in video art from the School of Visual Arts Photo, Video & Related Media Program, 2011. 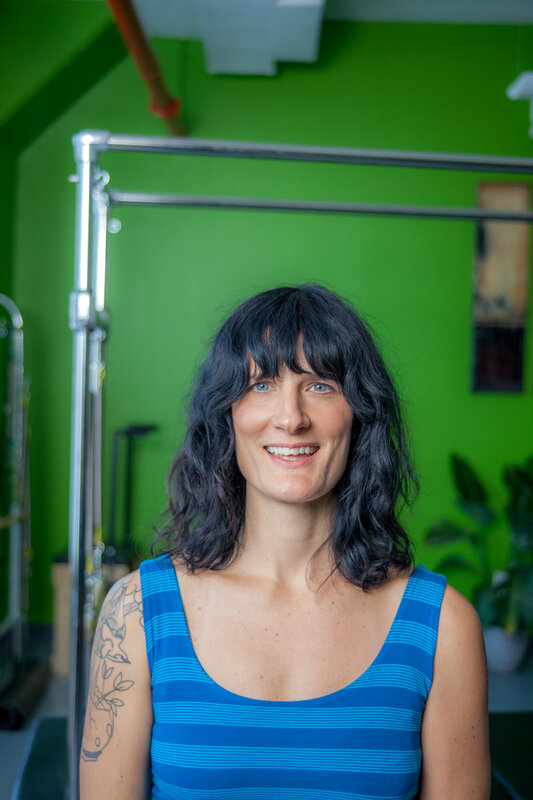 She works with students in a thoughtful and dedicated manner to help them become aware of individual habits and patterns that often interfere with easy, efficient, pain-free movement.